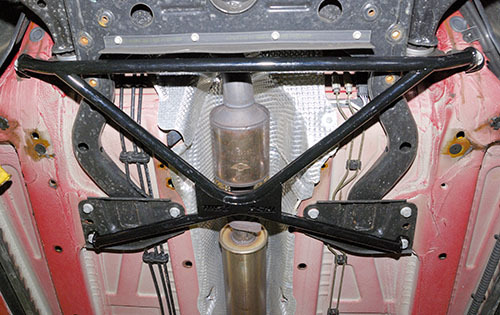 TSW X-Brace for the 2007-13 R55, R56, R57, R58, R59 MINI Cooper, Cooper S, Clubman, Coupe and Convertible mounts under the vehicle for better torsional rigidity. Dr. Mike gets complete credit for the ingenious design done in true grassroots motorsports style. Fabricated and welded in the USA using 1" ERW steel and laser cut gussets then powder coated black. 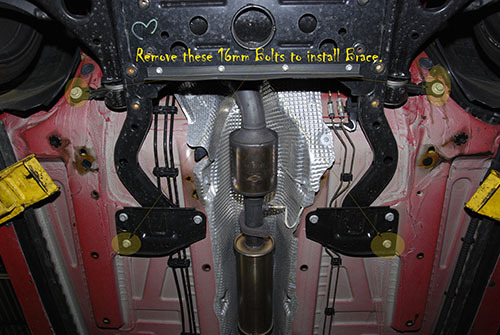 The TSW X-Brace uses 4 existing bolts and installs in 10 minutes. 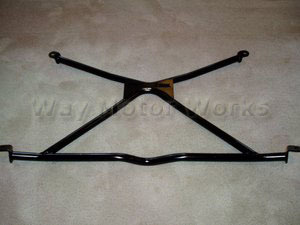 The X-style brace is designed to resist the twisting motion that goes along with the torsional loading of the chassis. In other words, the suspension will react more precisely to uneven surfaces, particularly in situations where one wheel experiences a bump or dip. It's designed to tuck up as far as possible but take it easy on those nasty speed bumps! VERY easy installation. Uses a 16mm 1/2\&quot; socket and could actually be installed without lifting the car. The only issue I had were the front exhaust hangar of my Invidia Q300 exhaust were contacting the brace. Remedy is one of two steps. Temporarily remove the brace and bend the exhaust hangars upward ~ .5\&quot; using the lip of the floor jack cup, a few targeted blows with a small sledge hammer, or cut ~ .25\&quot; off the end of the hangar. Over all impression is excellent. Well constructed, very easy install, and NO cabin noise. My R56 feels even more planted when corning.